The News Office aims to share MIT’s story with members of our own community — and with the wider world. We provide a steady output of high-quality articles, images, and video, amplifying the reach of web-based content through the judicious use of social media and engagement with the news media. We also seek to engage and assist MIT communications staffers who work outside our office, offering access to our Institute-level platforms to help raise the visibility of their content. 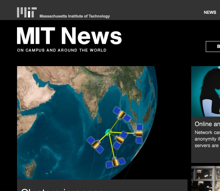 Visit our site to read the latest MIT news.